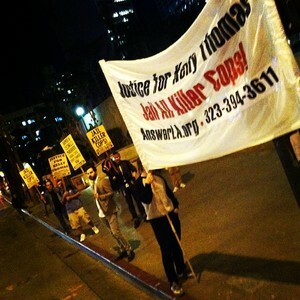 One day after former Fullerton cops Mark Ramos and Jay Cicinelli were acquitted of the murder of Kelly Thomas, a homeless and mentally ill man, the ANSWER Coalition organized a rally in downtown Los Angeles demanding justice. Protestors gathered at Pershing Square from across the city, including a significant show of force from the local homeless community, who compared their own experiences with the Los Angeles Police Department to those of Kelly. Many people passing the demonstration stopped and picked up a sign to join and expressed outrage that a blatant, video-recorded murder could be ignored. Organizers agitated for nearly two hours to onlookers during rush-hour traffic and gathered hundreds of petitions from pedestrians who supported the effort to win justice for Kelly regardless of the court decision. A major demonstration is planned for Saturday, June 18 at 10:00 a.m. outside of Fullerton Police headquarters. The ANSWER Coalition calls on all opponents of police brutality to join the action and to organize actions in solidarity in their own cities.